(sott.net) You’ve heard about the Occupy Wall Street protests in New York, Los Angeles, London, Toronto, Berlin, Tel Aviv and elsewhere around the world. But did you know that huge demonstrations have been taking place in Tokyo as well? We certainly didn’t until a SOTT forum member sent us the details. 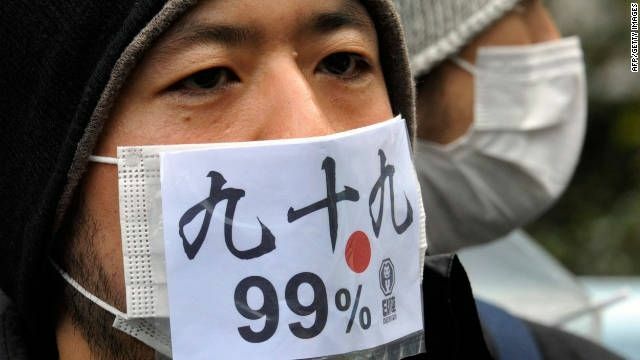 The general lack of awareness of the protests in Japan is probably due to the fact that there has been zero coverage of ‘Occupy Tokyo’ – which has grown out of the country’s large (and growing) grassroots anti-nuclear movement – in Japan’s mainstream media. (japanfocus.org) Koide Hiroaki began his career as a nuclear engineer forty years ago drawn to the promise of nuclear power. Quickly, however, he recognized the flaws in Japan’s nuclear power program and emerged as among the best informed of Japan’s nuclear power critic. His cogent public critique of the nuclear village earned him an honourable form of purgatory as a permanent assistant professor at Kyoto University. Koide would pay a price in career terms, continuing his painstaking research on radio nuclide measurement at Kyoto University’s Research Reactor Institute (KURRI) in the shadows. Until 3.11. Thousands across the nation and overseas watched Koide’s criticism of the government being webcast, sharing through Twitter the excitement of seeing their best kept secret being unveiled in a grey business suit, at the centre of Japanese politics – the very centre he has exposed throughout his career. At the same time, a human chain was being formed around the building of the Ministry of Education, Sports, Science and Technology (MEXT) where Fukushima parents and their supporters rallied to protest against the ministry’s decision to raise the allowable radiation exposure level.2 Viewers of the two simultaneous events had one eye on the relentless Koide, and the other on teary and angry Fukushima parents. (examiner.com) Japan has passed a law that will enable the police and contractors to monitor internet activity without restriction to “cleanse” the Internet of any “bad” Fukushima radiation news. (greenleft.org.au) Three months after the earthquake and tsunami that triggered a nuclear disaster in Japan, new radiation “hot spots” may require the evacuation of more areas further from the damaged Fukushima Daiichi nuclear power facility.